I'm at nearly 100 on my Bloglovin' subscription count, and that's after a major clear-out. I've been reading fashion, beauty, lifestyle and interior design blogs for at least 6 years now, and I still love coming across new gems. Here are my Top 10 at the moment, and a few extra classics at the end. I feel like I can successfully own a house after reading Apartment Therapy. You can find all things home-related here, with topics ranging from detailed organization to quick and easy decor. 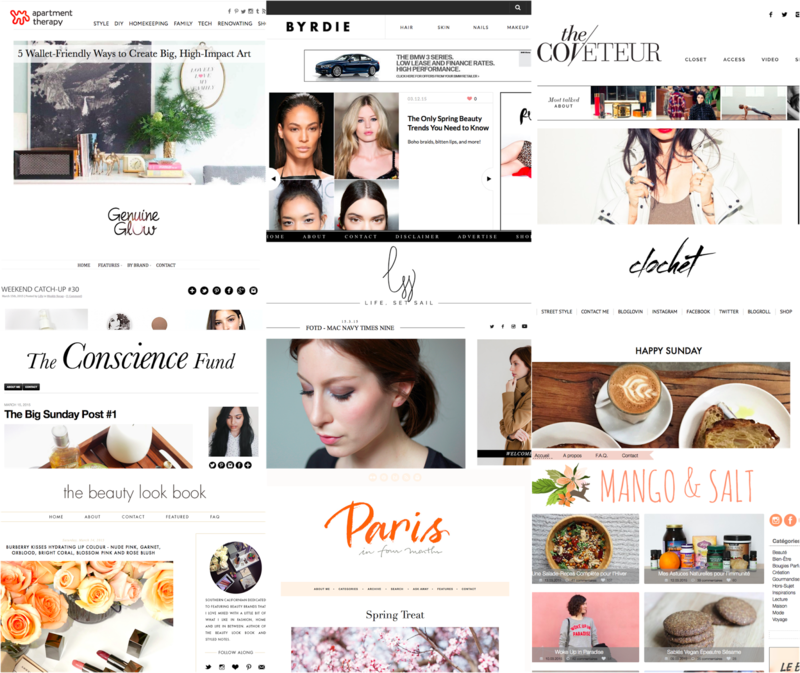 This has been my go-to site for the best beauty articles over the past few months. I'm currently loving their hottest spring trends and ideas for styling short hair. Who doesn't love designer interviews and nosy photos into the closets of fashion/beauty industry idols? I can't get enough of The Coveteur. Brittany is probably one of the most naturally beautiful people I have ever seen. I am so inspired by her style and her crisp photos are just lovely to look at. I think Lilly just wakes up looking perfect. She reviews tons of organic beauty products and her naturally tanned skin is swoon-worthy. Divya has some fabulous skincare tips and we are totally on the same page where favourite products and brands are concerned. She takes really great product photos too. Sabrina seems like such a classy professional who really knows how to indulge in makeup and beauty products. I love scrolling through her dreamy designer swatches. Victoria is one of my favourite French bloggers who is living in Barcelona for school. She has that perfect Parisian style that I adore and her wonderful writing keeps my French comprehension sharp. Izortze writes a classic style blog and is always on point with her outfits and street style photos. I used to be addicted to sites like lookbook.nu and Clochet is a reminder of my love for daily fashion. Carin is a Swedish photographer who moved to Paris after falling in love with the city. She documents the most stunning photographs on her blog. I especially enjoy her Instagram feed. Other very well known blogs topping my list are: The Man Repeller for the best fashion humour ever, Cupcakes and Cashmere for a daily dose of pretty, The Beauty Department for helpful how-to's and Beautezine for fantastic (Canadian!) reviews.